Non-residential construction remains in a growth phase. Office space vacancies have been stable, but the sector is still seeing the most speculative building on record. Meanwhile, warehouse and flex-space sectors are ripe for investment with low vacancy and increasing rents. Experts see industrial construction leading the way over the next two years, and clients are focusing on sustainability and prefabrication. 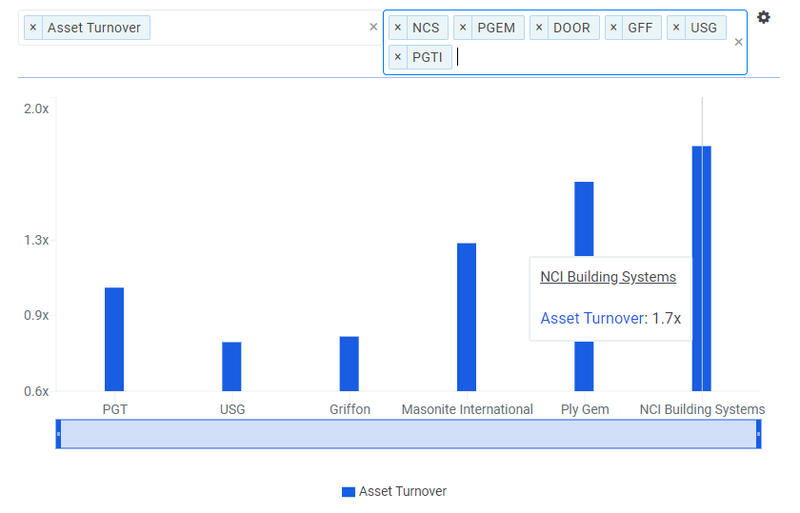 NCI Building Systems addresses these needs, enjoys market leadership in most of its product lines, and has high penetration across commercial building sectors. Rising steel prices are a headwind, but management has dealt with similar environments before, including a 30% steel tariff in 2002. The stock looks neglected despite impressive return and efficiency ratios. Price multiples confirm it is undervalued, and Wall Street and quant valuation models see upside of 20%+ and 30%+, respectively. 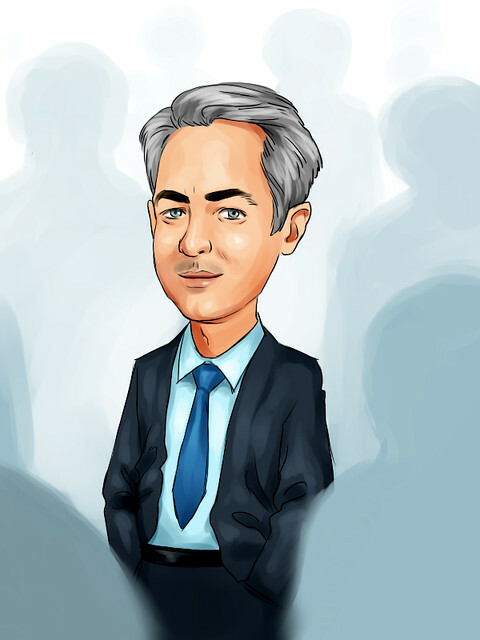 Get Our Activist Investing Case Study! Get the entire 10-part series on our in-depth study on activist investing in PDF. Save it to your desktop, read it on your tablet, or print it out to read anywhere! Sign up below! See 2017 Hedge Fund Letters. This year is expected to be another impressive year of growth in commercial construction. National Real Estate Investor recently reported: "Speculative office construction—as a percentage of supply underway—is expected to be at the highest level it has been in years in 2018, according to commercial real estate data firm CoStar." While vacancy rates have remained stable in traditional office buildings at around 16.5%, warehouse and flex-space has been in high demand. 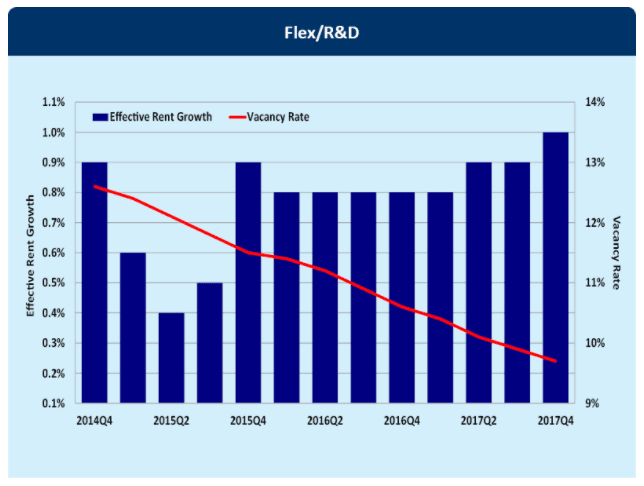 The chart below shows how flexible/R&D office space vacancies have steadily fallen to below 10%. Warehouse space vacancy, thanks to ecommerce, is even lower at 8.9%, generating growth in rents (second chart below). Low vacancies and higher rents are expected to drive investment in new construction, and the American Institute of Architects ("AIA") believes that the pace of construction activity will accelerate through 2019. The commercial/industrial construction sector is expected to lead the way in 2018 with 4.4% growth, "while industrial (+5.2%) and education-related projects (+4.9%) will be 2019's top performers." The AIA produces a monthly report updating a variety of leading indices, and providing insight into the non-residential construction industry. Their most recent report in February indicated that architecture firms had seen their 5th consecutive month of rising billings, and were seeing continued positive momentum in inquiries and contracts. Two of the major trends in commercial construction right now are utilizing prefabricated construction and being green. An AIA survey on the top design trends over the next decade pointed to offsite construction as the number one response. Offsite construction generally leads to more environmentally friendly production, as it is encapsulated in a factory. Prefabricated materials can also improve building efficiency, and lead to certification by the U.S. government's ENERGY STAR program and the U.S. Green Building Council's Leadership in Energy and Environmental Design (LEED) program. Also important in green construction is the material lifecyle, which looks at the impact of its production, service life, and ease of recycling. The investment in green construction can payoff. Dodge Data & Analytics found that green buildings provided a 7% value premium, and the number of environmentally friendly projects is expected to double every three years. 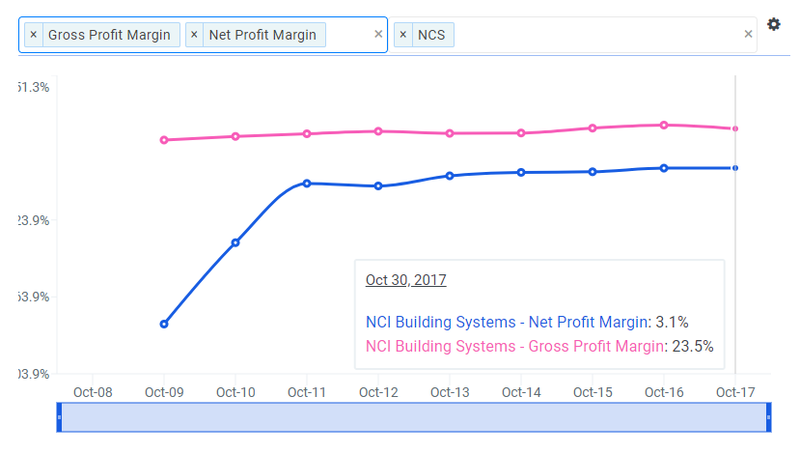 Benefiting from the wide swath of growth in non-residential construction is NCI Building Systems, Inc. (NYSE: NCS). The company serves a number of commercial sectors, providing prefabricated buildings and components for manufacturers, mining and energy companies, retailers, wholesalers, schools, governments and do-it-yourselfers. 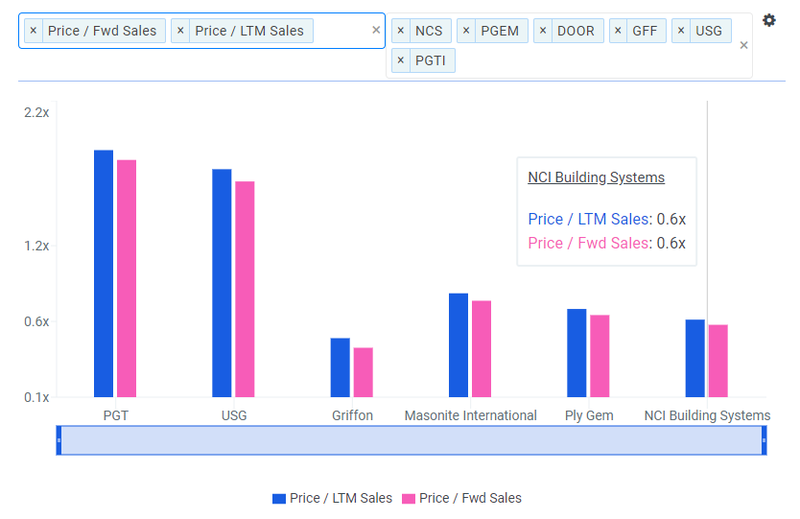 NCI Building Systems, which will be referred to by its ticker NCS hereon to minimize confusion, is primarily in the low-rise steel building business. This description can conjure up images of boring corrugated warehouses, but the usage of steel structures is more common than most realize. NCS also sells insulated steel panels, coated steel, and ancillary steel components, so the new steel tariffs immediately come to mind as an issue. NCS's CFO Mark Johnson addressed the prospects of tariffs in the March 7 earnings call: "You know, we’ve seen some pretty volatile steel cost events in the past - 2002 was a really good example, where there were 30% tariffs implemented during that year, and they caused some reaction in the steel cost. It was something that had not been seen before in that area, and in that time with very drastic increases in steel, I believe it went up on average 18% that year, and at one point as high as 48% higher, and during that time our margins held the same as they were in the prior year and our earnings went up. So we’ve managed through this several times - 2002, 2004 and 2008, and in all of those cases our margins for the year were flat or better than they were the year before." NCS's March Investor Presentation features gross margin comparisons to steel used and steel price. Correlations can be tough to trust without knowing the true calculation methodology. Steel volume and gross margin look to move together. However, correlations will not pick up on delays, and it looks that gross margins do fall in the year after price spikes. Regardless, rates of change, especially when using a price index, should be used for a fair comparison. The company is able to manage a rise in steel prices without killing margins because of the various delivery times across its product lines, and the ability to increase prices in its backlog at production time. Management claims that as they see some compression in margins in the longer-dated Engineered Building Systems as input prices rise, it is offset by expanding margins in Metal Coil Coating and Metal Components, which react to prices immediately. Remaining on the topic of steel, it is a very sustainable building material due to its strength. It is also recyclable. NCS purchases 30-60% recycled steel, and its products are nearly 100% recyclable at the end of their useful life. Adding to the environmental positives noted in the previous section, the prefabrication of its building systems in a factory environment means less scrap and controlled emissions - as well as more precise production. Lastly, NCS offers products that help towards green certification, notably their insulation panels earn LEED credits for building projects. Despite steel prices rising for years, margins have been fairly stable. NCS's net profit margin does not measure up well against peers or the sector. Management recognizes this, and has been focused on cost efficiencies across all the lines of business. However, Return on Invested Capital and Return on Equity indicate management is performing above its peers. Management's execution can also be judged by a more traditional efficiency measure, Asset Turnover, which is how much revenue a manufacturer can generate from its asset base. Here again, NCS is outperforming its peers. Growth metrics indicate superior long-term sales growth and net profit growth, but sales growth expectations are lackluster. Executives have also been working on cleaning up its balance sheet, and refinanced nearly all of its debt, which will negatively impact Q2 due to early redemption costs. 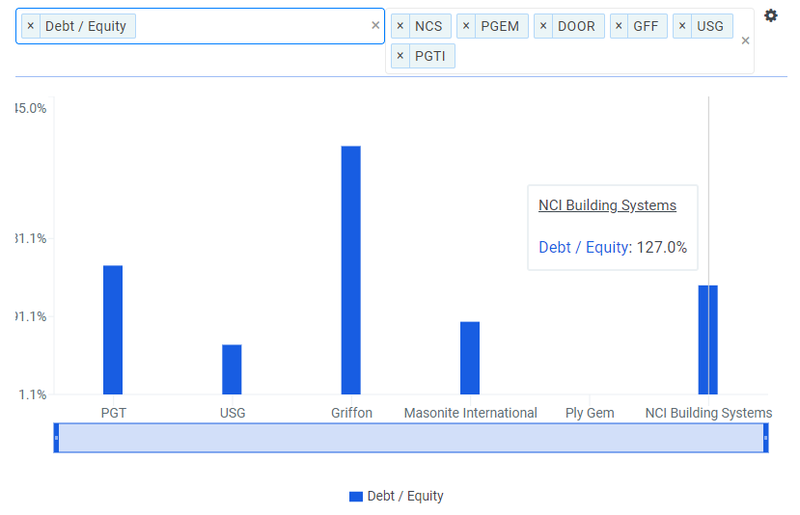 The company, not unlike any manufacturer, does employ leverage with a debt/equity ratio of nearly 1.3x. This gearing is middle of the pack for its peer group. The ability to pay off debt can be viewed as the capability to make interest payments, where NCS is safely near the top of the pack. However, a much more conservative view of debt is using the Cash ratio, which divides cash and equivalents by total debt. NCS's 0.2x is tied for worst with two other peers. Overall, the company looks to be executing better than its peers, has been growing profit margins, lowering its debt costs, and has strong market share in the sectors expected to grow the fastest in 2018 and 2019. The company is moderately leveraged compared to its peers, and can pay interest expense nearly 4x over. Most importantly, it has survived and grown in similar steel pricing environments, and is being neglected as the market paints any company with steel inputs as a problem. The market's first reaction to news is panic with entire industries getting discounted. For those willing to do the research, this reaction presents a buying opportunity for value investors. The steel tariff fallout is negligible for NCS, but it still looks oversold. NCS has the second lowest P/E ratio, and the lowest Forward P/E across its peers. As EPS can be engineered, a more pure comparison uses Price/Sales. NCS has the second best trailing and forward sales multiples across its peers. Generally, the tie breaker when looking at the sales and earnings multiples is EV/FCF. Enterprise value is a proxy for the purchase price of the company, and free cash flow is the actual cash the company has left over after funding operations. EV/FCF indicates NCS is trading at an average valuation, not too hot or cold. Another view using EV addresses the depreciation issues that can affect a heavy asset company's earnings by using EBITDA. 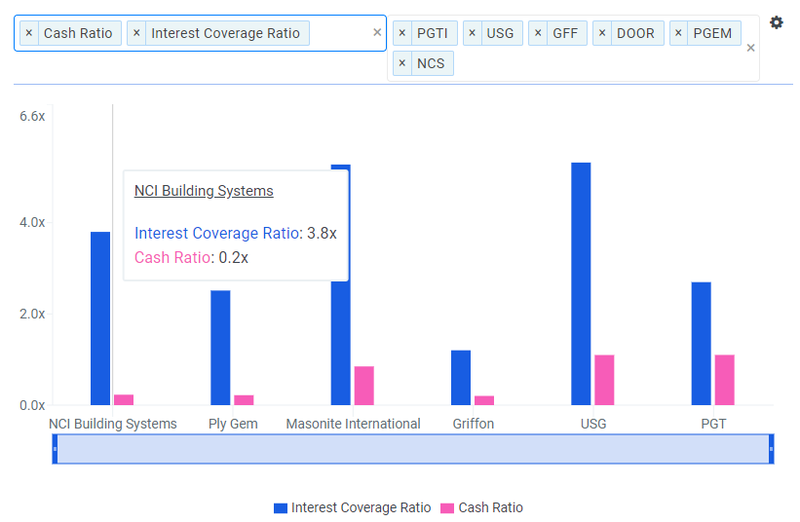 By this multiple, NCS is undervalued relative to its peers. 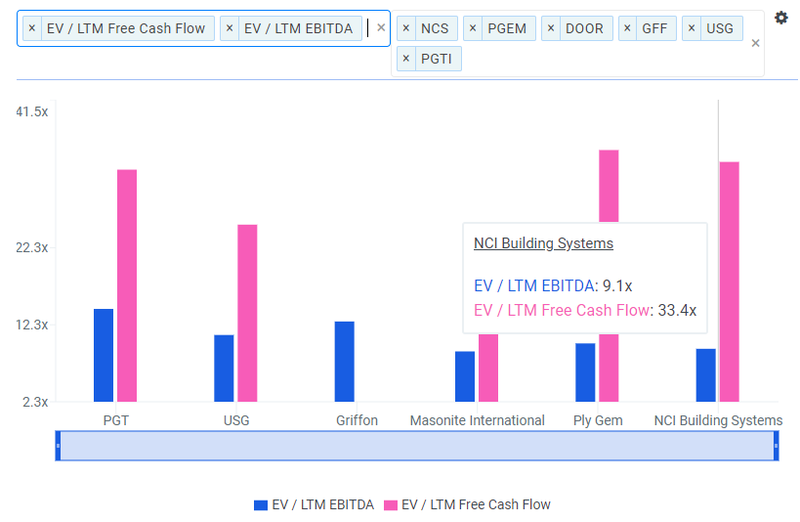 With the multiples pointing to NCS being undervalued, Wall Street analysts and Finbox.io's quant valuation composite can help confirm and quantify by how much. Finbox.io's quantitative Fair Value points to a 30.4% upside. It is made up of 10 individual models that include five and 10-year DCF's, price multiples, and Earnings Power. Emotionless models are a good check against Wall Street analysts who see 20.3% appreciation in NCS. The company has surprised analysts in the last two quarters, featuring a beat by 40% last quarter. Analysts are calling for 56% EPS growth next quarter and 59% on the year, but expectations for this quarter, which falls in a seasonal lull, are 12.5%. Management's sales guidance for this quarter is $430-$450 million, and analysts sit under the midpoint at $437 million. Facing increasing rents, low vacancy rates, and an economic expansion, commercial building continues to see growth across a number of sectors. These trends, along with the demand for sustainability and prefabrication, favor a company like NCS, which has a broad reach across sectors and 1st or 2nd place market penetration across its product lines. Rising input prices are always a headwind for the construction industry, and recent steel tariffs have created uncertainty. However, NCS's management has been through this exact scenario multiple times in its history, and has a track record that shows stable to expanding margins in similar environments. The company is executing well based on return and efficiency ratios, and managed to cut its debt service by nearly half with a major refinancing. 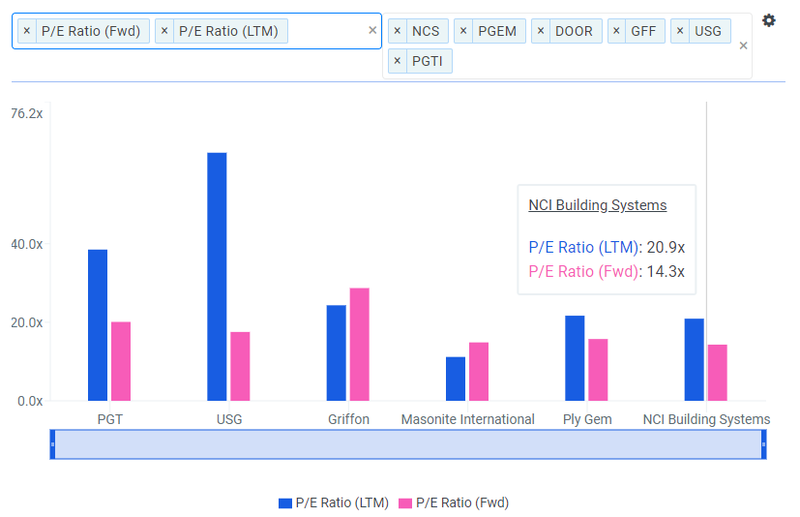 Price multiples show that NCS is undervalued relative to its peers. EV/FCF did not confirm that the company is undersold, but was not out of line with peers. The more traditional industrial measure of EV/EBITDA agreed with the price multiples that the stock has room to grow. Further confirmation of an upside comes from Wall Street experts and Finbox.io's quant-based Fair Value. Wall Street sees a 20% upside, while Finbox.io's target predicts a gain of 30%+. As the market loses its fear of a trade war and begins to focus on fundamentals again, NCS is set to fabricate additional gains.